This is a simple recipe but is always in demand from my husband. He has perfected the art of making Raita & now is the family, friends & relatives Raita chef for all occasions. I’m sharing his recipe which we like, however like any Indian food, spices can be adjusted as per your taste buds. Also, one specific detail different from other boondi raita is that we do not soak boondi before hand as we like it crunchy. It is usually a practice to soak boondi before hand in lukewarm water and allow it to soak as much water it can, so that it cannot soak any more later. 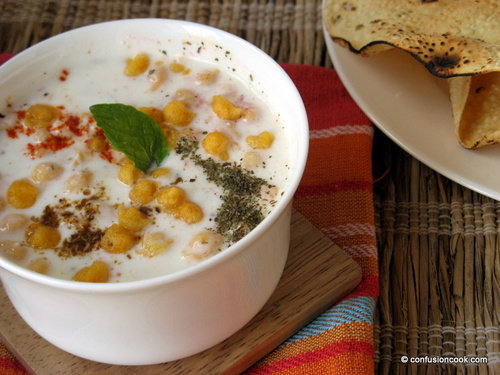 Once it is done, boondi is squeezed to remove all water & then added to the raita. This makes the boondi soft & mushy. We both like it to be crunchy so we skip this step completely and add crunchy boondi just before serving. Place curd in a small bowl. Using a whisk completely smooth out the curd. Add water. You can use more or less water depending on what consistency you enjoy. We like it a medium consistency. Also boondi will absorb lot of water so we keep little extra. Add spices. Taste & adjust them as you require.